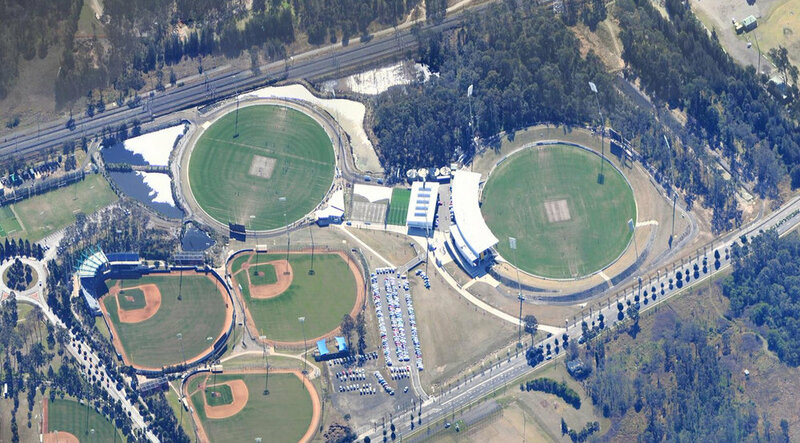 Located within the Western Sydney Parklands and close to Rooty Hill Railway Station, Blacktown Olympic Park (BOP) provided the venue for baseball and softball during the Sydney 2000 Olympic Games. Blacktown City Council was approached by the AFL and Cricket NSW with a proposal to develop new facilities in collaboration with Council and the NSW State Government. Corkery Consulting was engaged by Council to carry out a Feasibility Study for the expansion of the existing sporting facilities to accommodate two new ovals, both suitable for AFL and cricket, as well as indoor and outdoor practice facilities. A comprehensive site analysis was carried out to provide the basis for a series of layout options that incorporated the proposed facilities. A preferred Master Plan was selected by Council and progressed to detailed design and documentation. Following adoption of a preferred Master Plan Corkery Consulting was engaged by Council to prepare landscape design drawings to form part of the Development Application documents and to provide advice on site planning issues. Located within the Western Sydney Parklands and close to Rooty Hill Railway Station, the Blacktown Olympic Park is managed by Blacktown City Council as a major regional sporting facility incorporating baseball and softball facilities developed for the Sydney 2000 Olympic Games. However, when the AFL and Cricket NSW proposed the development of two new ovals on the site it was apparent that major challenges had to be addressed for the new sporting facilities to be incorporated on the site. In particular a significant stand of remnant Cumberland Plain Woodland needed to be protected and potential flooding taken in to account. Feasibility Study to identify and address all of the site constraints and to prepare a series of master plan options for the expansion of the existing sporting facilities. The expansion involved development of two new ovals, both suitable for AFL and cricket, together with indoor and outdoor practice facilities. A comprehensive analysis of the site and adjoining existing sports facilities (softball, baseball, athletics and soccer fields) was carried out that included ecological, Aboriginal heritage, stormwater, flooding, access and circulation issues. The site survey carried out by Ecological Australia assessed the high ecological values associated with remnant Cumberland Plain Woodland. In addition Aboriginal heritage values and flooding hazard were recognised as major site constraint to be addressed in the master planning process. A series of layout options were prepared that included two new ovals, suitable for both AFL and cricket, together with indoor and outdoor practice facilities. Oval No. 1 included a stadium that incorporates change facilities and function room as well as seating on turf-covered slopes. Extensive consultation was carried out with Council Officers, Blacktown Venue Management and representatives of the AFL and Cricket NSW as major users of the facilities.